This salad is seriously delicious. 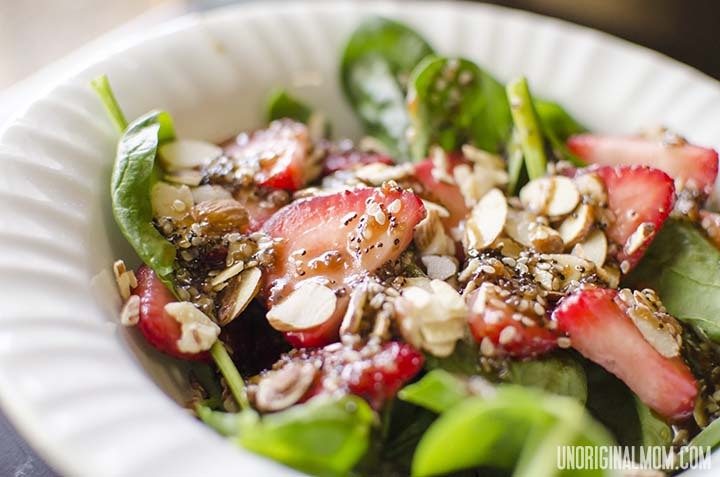 It is so simple…strawberries, spinach, and almonds with a sweet and tangy balsamic poppy seed dressing. Adjust the amount of sugar in your dressing to taste – I like it very sweet! Especially this time of year, when strawberries are in season, it’s not an expensive salad to make, either! It’s great to take to potlucks or dinner parties. You’ll always come home with an empty bowl! Make the dressing ahead of time. I put it all together in the food processor to chop up the onions really finely. I am NOT a fan of raw onions…but I LOVE this dressing! Definitely don’t omit the onions. Also, don’t dress the salad until right before you’re ready to serve it, so the spinach doesn’t get soggy and wilted. Extra dressing can be kept in the fridge – it keeps well! I love to make the dressing ahead of time, keep the ingredients in the fridge separately, and toss them all together in a single serving for a quick and yummy lunch. Be creative with the toppings. You could use crumbled walnuts in place of almonds, add some feta or gorganzola cheese…whatever you like! This recipe is adapted from the AllRecipes.com recipe here. Combine olive oil, vinegar, onion, and Worcestershire sauce in blender or food processor. Combine until onion is minced and dressing is well mixed. Whisk in the sesame and poppy seeds. Cover and chill for at least 1 hr or until ready to serve. 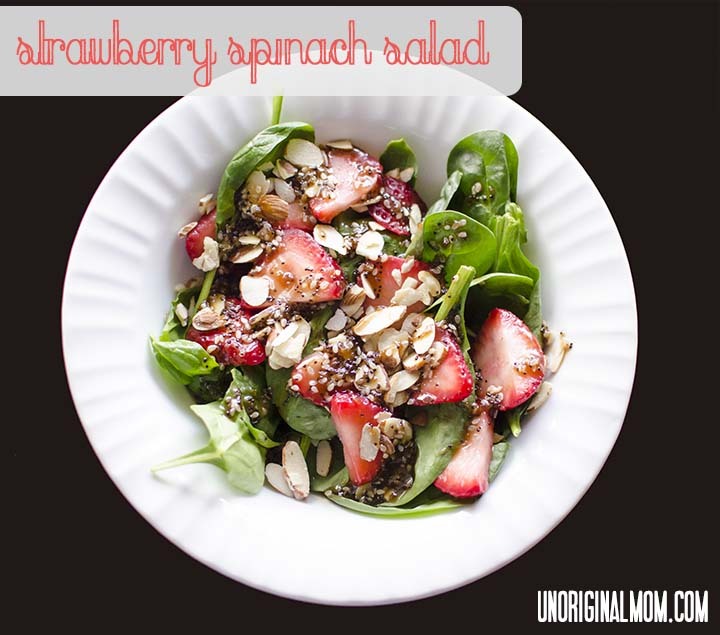 In a large bowl, combine the spinach, strawberries, and almonds. 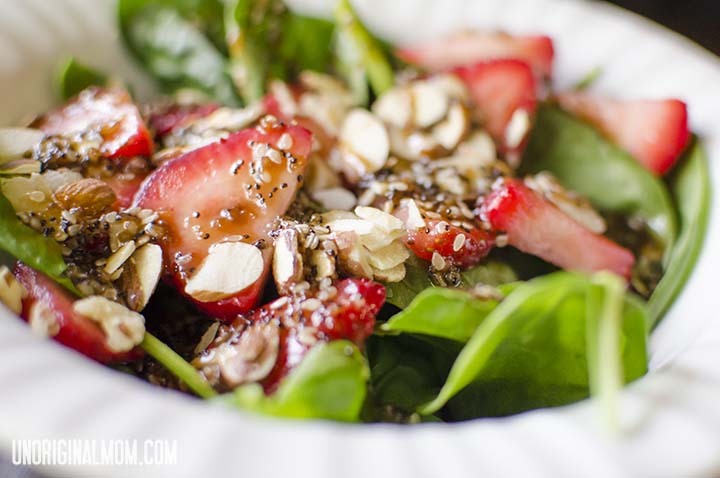 Yes, fruit is really yummy in salad…strawberries and spinach go especially well together…but it’s the dressing that really makes it incredible! I think it would be great with mandarin oranges, too! My Grandma makes this salad every summer! It is DEFINITELY a family favorite! Whenever I’m asked what I want to eat at Grandma’s house, THIS is what I choose!!!! :) Hope yours was just as DELICIOUS!!!! This salad looks perfect for a summer lunch! Saw your post over @ Someday Crafts. Please visit me sometime! I love these type of salads! They are so easy and tasty. Reminds me Zupas! Thanks for sharing would love for you stop over at my blog when you get a chance! This looks great. I can’t wait to try it. Maybe I can get my picky kids to eat spinach if it is a little bit sweet. Ohh….that looks so refreshing and delicious. 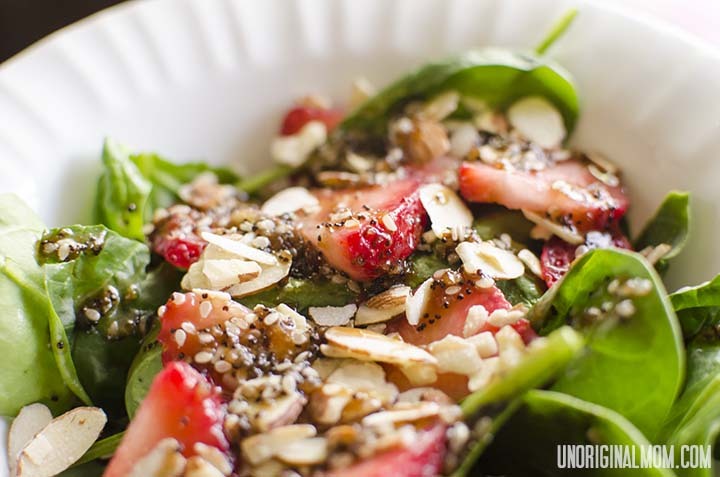 I love a good spinach salad, and this looks so good! Thanks for linking it up at The Better Half, and I hope you’ll come back for this weeks link party too. Thanks Krista! The dressing is SO good…you will love it! Nothing screams summer like fresh berries, and this salad is mouth-watering!! This is my fave kind of salad! I would love for you to share at my party! Yummy! I could live on this kind of salad in the summer months!! Thanks for sharing at Monday Funday!! Hope your day is Extraordinary! Thanks Diane! Yes, this is one salad I never get tired of eating leftovers from! This salad looks awesome, Meredith! I shared this on Google+ today :-) Thank you for sharing at our ALL MY BLOGGY FRIENDS party ! Thanks so much for visiting and for the feature, Emily! Thanks so much for the feature, Kathryn! Hi Meredith! I make a similar salad, but with a different type of dressing, so I’m anxious to try yours out. Found you through Mostly Homemade Mom’s 5/15 link party – thanks for sharing! Oh my word, I am SO trying this out! Thanks for re-sharing on Facebook – – especially since I missed it the first time around.